PJ Masks is an animated children’s TV series about super heroes that has gained huge popularity in recent times and escalated sales for its toy merchandise. PJ is for pyjamas, because the key characters Conner, Amaya and Greg, have to wait till night time to put on their pyjamas and activate their animal amulets to transform themselves into superheroes Catboy, Owlette and Gekko. The characters are 6 year olds who go to school like other kids by day but when anything goes amiss in their city, they take on an action adventure, filled with curiosity, a sense of justice to solve it and learn valuable lessons along the way. The animated series is based on the `Les Pyjamasques' book series by French author Romuald Racioppo. 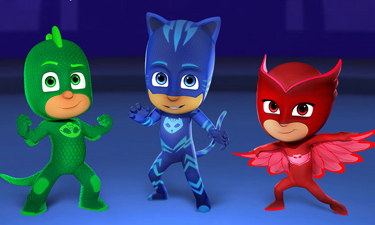 PJ Masks is the number 2 pre-school property (YTM May 2018) and continues to see strong growth supported by the series airing on Disney Junior from early 2018. The top trending toy lines from the series including TV advertised Super Moon toys are available at Baby Brands Direct to trade. Kids will love re-enacting scenes from the popular PJ Masks T.V. series that sees kids like themselves becomes animal superheroes by night. Each character has a distinct colour, red, blue and green and encourages collection of the range but also interactive play with toys of other kids. There is a variety of product to choose from including figures, vehicles, play sets to actual masks!